Clean Bright Furniture ... Again! My Dad's Cleaning Service's upholstery cleaning experts know that dust is the biggest culprit in the premature aging of furniture. Gritty dust blows in through ducts and windows and becomes embedded in your furniture's upholstery. You know how quickly dust can accumulate on the surface of a table. The same is true with your upholstery, only you can’t just dust it away! When this dust combines with pet dander, food particles, dirt and pollen, the result is an abrasive grit that damages your upholstery. 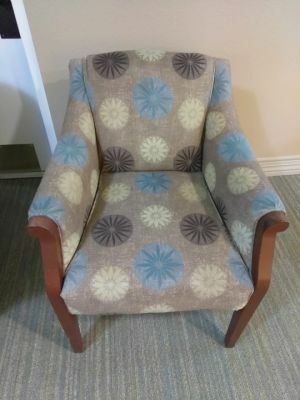 My Dad's Cleaning Service can remove your upholstery cleaning headache and leave your furniture clean and looking like new. My Dad's Cleaning Service recommends cleaning your upholstery at least once each year. More often if you have kids or pets, do a lot of cooking, smoke, or open the windows often. Stop! Before you use a commercial product that may damage your upholstery, call the experts at My Dad's Cleaning Service. Stain removal is a science. The method required for your upholstery cleaning depends on the type of stain and the type of fabric. While many fabrics are best cleaned by hot water extraction, others bleed and run when liquid cleaners are applied. These fabrics require special care. Whatever your stain problems, you can count on the upholstery cleaning experts at My Dad's Cleaning Service to fix the problem. You can rest assured that My Dad's Cleaning Service technicians have the training and experience to remove the toughest stains and leave your upholstery smelling fresh and looking new again.